The unranked US-American earns his first ATP-Ranking point by reaching the second round of the $15,000 ITF Pro Circuit hard-court event. Zachary Svajda of Pacific Beach in San Diego County didn’t quite know what to expect when he walked onto the Stadium Court at the Claremont Club to face the tournament’s top-seeded player on Wednesday. The 15-year-old wild-card entry Svajda proceeded to shock the world’s No. 601st ranked player Joao Lucas Reis Da Silva of Brazil, 6-3, 6-4, to earn his first ATP World Tour ranking point as first-round play was completed at the Claremont Club Pro Classic, a $15,000 USTA Pro Circuit Futures event. Svajda is a high school sophomore who is home schooled and coached by his father Tom Svajda, a teaching pro at the Pacific Beach Tennis Center near Mission Bay who is originally from Texas and played Kalamazoo as a junior. He trains with his 12-year-old brother Trevor and his Serbian coach Uros Petronijevic, the former No. 1 player for the University of San Diego who was on hand watching the match Wednesday along with Tom. Svajda said he watched a Reis Da Silva match on YouTube recently and knew he had won a $25,000 Futures event on clay in his native Brazil back in May beating US Open Junior Boys’ champion Thiago Seyboth Wild of Brazil in the final. “He’s really good and had a good backhand,” said Svajda, who said his forehand is his top shot and that he’s grown a lot recently standing 5-foot-8 and still growing. Later in the day, Svajda and Strode met Reis Da Silva again in doubles and the local wild-card team lost in straight sets. Svajda on Thursday will face college senior Nicolas Moreno de Alboran, 21, UC Santa Barbara’s top player. Moreno de Alboran is originally from New York City, but attended high school in London. Former UCLA star and two-time NCAA doubles champion Martin Redlicki won his first-round match in straight sets, as did his former Bruin teammate sophomore Keegan Smith, and USC’s Daniel Cukierman and Brandon Holt. 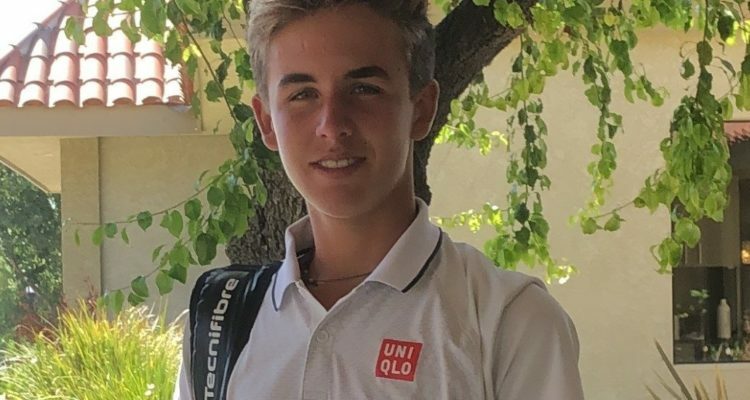 This entry was posted in ITF World Tennis Tour, ITF World Tennis Tour News and tagged ITF Pro Circuit, The Claremont Club USTA Pro Classic, Zachary Svajda.